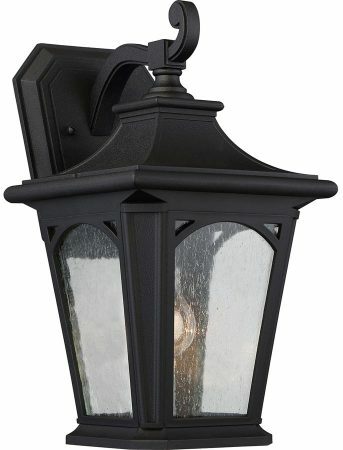 This Quoizel Bedford medium outdoor wall lantern in mystic black finish with seeded glass is rated IP44 and features a scrolled arm and clear seeded glass panels. Boasting a tapered wall mount, top mounted scrolled arm and medium tapered lantern in mystic black; featuring a sloped roof and arched window panels for a good all-round light. Part of the coastal collection of exterior lighting, created to handle extreme locations. A classically designed lantern suitable for any home exterior wall. The clear seeded glass adds an aged feel and works perfectly with the soft mystic black finish. It is made of Quoizel’s ‘coastal armour’ polycarbonate material, created to handle extreme heat and brutal cold. Supplied with a manufacturers five-year warranty. An ideal candidate for any home exterior whether of modern or traditional decor. If you are searching for quality outdoor lighting in a classic style, the Bedford suite should be considered. Fully weatherproof and supplied with a manufacturer’s 5-year anti corrosion warranty, which relates to the corrosion of finishes on outside lights like this one. There are matching fittings available in the Bedford lighting range that includes small and large wall lanterns, a pedestal light and hanging porch lantern; please see below. This exterior light is supplied by Elstead Lighting and designed in the USA by Quoizel, founded in 1930 in New York. Their designs embody a history of being artisans in glass and natural materials that illuminate your living space and enhance the beauty of your home, such as the Bedford medium outdoor wall lantern in mystic black finish with seeded glass featured here.